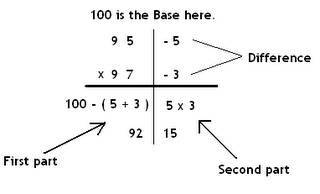 Multiplication of two numbers around 100 is even easier than you could ever imagine. Suppose you want to multiply any two numbers, lets take 95 and 97 for example. Step 1: We'll find out the difference of the two numbers (95 & 97) from 100. 97 is 3 less than 100 [100-97=3]. So after subtracting , we get 92 [ 100 - 8 = 92 ]. This becomes first part of our answer. Step 3: We multiply the two difference amount i.e. 5 & 3 to get 15 as the second part of our answer. So our final answer becomes 9215. Easy isn't it ? If you still didn't get it , here's another example for you. Suppose you mulitiply 88 & 96. Step 1: Difference of the two numbers ( 88 & 96 ) from 100 are 12 and 4 respectively. Step 2: Subtracting the total difference of 16 [100- (12 + 40)] from 100 we get 84. [100 - 16 = 84]. So 84 becomes the first part of our answer. Step 3: Now, we multiply the two difference amount of 12 & 4 to get 48 as second part of our final answer. So the final answer becomes 8448 . Answers: a) 8556 (b) 9212 (c) 7480 (d) 8613 . You might also like: Easy way to multiply with 5 ..
Any suggestion or comment is welcomed from my part. Nice suggestion! Thanks for sharing. what if the second part is a three digit number? In the self exercise question three 15X12=180. then what should we do?